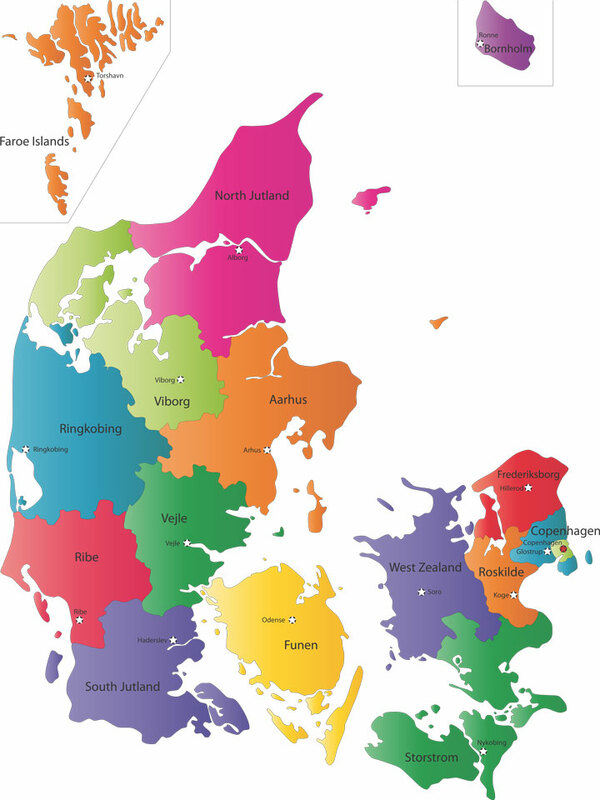 Colorful map of Denmark, showing the 15 traditional Danish counties and their capital cities. All information on Map-Of-Denmark.com is provided "as is." This website contains Denmark maps as well as geographic and travel information about the nation of Denmark. By using this website, you agree that Zeducorp is not responsible for errors or omissions, and shall have no liability for damages of any kind, including special, indirect, or consequential damages, arising out of or resulting from any information, product, or service made available hereunder or the use or modification thereof. Zeducorp authorizes you to view and print the materials at this Denmark Map website only for your personal, non-commercial use, provided that you retain all copyright notices contained in the original materials on any copies of the materials. You may not modify the materials at this website in any way or reproduce or publicly display, distribute, or otherwise use them for any public or commercial purpose. Thank you for visiting Map-Of-Denmark.com. We trust you found our website useful, and we invite you to place a link to Map-Of-Denmark.com on your website. Simply copy the following HTML link and paste it onto one of your website's pages to reference this informative website. We appreciate your consideration. Map-Of-Denmark.com, a division of Zeducorp.